One of the goals of the NISE Network is to foster effective education outreach partnerships between science museums and research centers, focusing on nanoscale and materials science research. Such partnerships leverage the content expertise of the research center partners with the engagement expertise of the ISE partners, to create a broad menu of programs, products, and experiences that can be further shared throughout the network. Research Center - Informal Science Education Partnerships (RISE) provides professional development, consulting, and resources for partnerships, and also develops trainings in communication and public engagement for early career researchers. Many of the science museums involved in the NISE Network have developed education outreach partnerships with nearby research centers. These partners have collaborated to produce exhibits, programs, media, special events, workshops, and professional development programs for educators, journalists, and researchers interested in public engagement. Some of these partnerships rely on volunteer participation, and are not specifically funded; others are funded through education outreach subawards to the participating museums from federally-funded university-based research centers; still others are funded directly as partnership programs. Our goal is to help museums and research centers find each other, establish relationships, and move on to developing more robust and better-funded portfolios of grant or sub-award-funded work. These regionally-based partners can draw on the resources of the NISE Network, adapting them to their own needs. Later, they can contribute to that body of community resources as they begin to produce their own products, programs, and experiences. This partnership development strategy is meant to provide a means of constant renewal of resources and sustained long-term growth for the Network as a whole, as well as a means of building ISE institutional capacity for engaging public audiences in current science and technology nationwide. Our intent is also to foster the further development of a professional learning community: cultivating the skills of science museum staff in tackling current research through university partnerships and cultivating the science communication and pubic engagement skills of researchers. 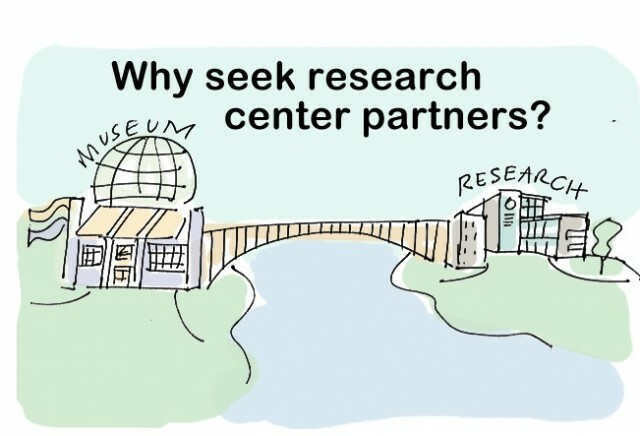 A Guide to Building Partnerships Between Science Museums and University-Based Research Centers: Step-by-step advice on planning, developing, funding, and maintaining education outreach partnerships between research centers and museums. This 50-page guide is an updated and consolidated version of the 2010 "Small Steps, Big Impact" guide posted on the web at www.risepartnerguide.org. Helpful for both science museum and research center planners, this 2013 edition is available both as a free 25-page landscape-view PDF download and as a handy 50-page 6x9 printed booklet that can be ordered for $12 including shipping from the Museum of Science, Boston. Research Experience for Undergraduates (REU) Science Communication Workshop: This is a two-session science communication workshop targeted to undergraduate students participating in university-based research programs such as NSF Research Experience for Undergraduates (REU) program, which typically occur during the summer months. University faculty and science museum staff integrate the sessions into the research program curriculum to enhance the students’ science communication skills, with an emphasis on professional oral, PowerPoint, and poster presentations. Sharing Science: Communication, Education and Outreach - A Workshop & Practicum for Early-Career Researchers: This Planning & Implementation Guide provides information and resources for planning and hosting a Sharing Science Workshop & Practicum (SSW&P) for early career researchers that will enhance their science communication skills, engage their interest in education and outreach, and prepare them for providing effective and rewarding education outreach experiences. To find out how the SSW&P has been successfully implemented at a variety of institutions, please read the Sharing Science Workshop & Practicum Dissemination Project Report. Making the Most of Broadcast Media Workshop: This a workshop designed to help working scientists get their work noticed in the media. Creating Stunning Scientific Posters Seminar: A seminar designed for early-career scientists about the successful design and use of scientific posters. Bringing Nano to the Public: A Collaboration Opportunity for Researchers and Museums, a guidebook targeted at university researchers. It covers the basics of informal science education and science museum practices and provides examples and information on partnering activities and practices. Mastering Science and Public Presentations Video: This seminar on technical communication and presentations was prepared and given by Tim Miller of SpokenScience.com. This seminar provides the fundamentals in sharing science as Miller explains how to choose the very best tools to do the job of communication and shares some of the tips and tricks that can help you take your scientific presentations to the next level. Miller led this particular version at Duke University in the summer of 2010. Glossary: Museum and Research Center Terms Related to the NISE Network: Because the NISE Network bridges the cultures of museums and the academic research world, participants from one profession may not always know the lingo of the other. At the same time, a shared vocabulary is essential for educators and researchers who want to truly collaborate on projects such as writing grant proposals. NISE Net Vignettes: A set of 10 videos capturing thoughts and voices on various subjects from researchers and museum professionals involved in the NISE Net community. For individual or institutional consulting, please email your request to rise@nisenet.org. RISE is also collecting at this address: case study stories, articles, and research about science museum – research center partnership and science communication training activities. The RISE Group blog, called the RISE Rap is written and curated by Carol Lynn Alpert at the Museum of Science, but guest submissions are welcome. Please email them to rise@nisenet.org. A research center - ISE partnership brought nanotech pioneer Don Eigler into the Museum of Science, Boston for a special NanoDays event. Kids loved getting their hands on his cool Atom-o-Scope web interface to direct the movement of a single atom poised on a metal surface in IBM's Almaden California laboratory. This 2009 journal article, published in Social Epistemology [23:3,267-281], reviews the NSF's Broader Impacts Criterion, some of the controversy surrounding it, and partnership approaches to fulfillment. This 2-pager from the Jan/Feb 2009 issue of ASTC Dimensions contains two companion articles describing the strategy of developing funded partnerships for educational outreach between nanoscale and materials science research centers and science museums. The articles, one by Bob Westervelt, Director of the Harvard Nanoscale Science and Engineering Center, and one by Carol Lynn Alpert, Director of Strategic Projects at the Museum of Science, describe the partnership from their respective points of view. This paper by C. L. Alpert is from the MRS Symposium W (Education) Proceedings from fall 2007, and was the first to introduce the concept that outreach partnerships between science and engineering research organizations and informal science education institutions (ISIs), such as science museums, can help research organizations to fulfill their "broader impacts" criteria as well as to advance their institutional interests in forging meaningful connections through the community. For the ISIs, such partnerships can help them serve their mission to public and school constituencies, providing more robust opportunities for increased engagement with current research. Because of the greater latitude for experimentation in ISI environments than typically found in formal education environments, these collaborative efforts can often produce innovative science education products and experiences that can also nourish and inform K-12 teaching practice and professional development. The NSF Nanoscale Informal Science Education Network is pursuing a strategy of fostering community-based partnerships between materials and nanoscale science and engineering research centers and ISIs in order encourage widespread collaborative development of effective science and engineering educational experiences for public and school audiences on an ongoing basis. It's a Balloon. It's a Bridge. No, It's NanoDays! This one-page Commentary piece by C. L. Alpert, illustrated by Jeanne Antill, and published in the May 2009 issue of Materials Today, describes the evolution of the NISE Net's NanoDays strategy and its role in helping to catalyze the formation of new partnerships between research centers and science museums. This one-page Commentary piece by C. L. Alpert, published in the May 2008 issue of Materials Today, makes the case for research center - ISE partnerships and calls on the research community to contact potential educational outreach partners early in the grant proposal planning process. This three-page Insight Feature piece by C. L. Alpert published in the May 2006 issue of Materials Today, makes the case for investment in nanoscale informal science education, partnerships between research centers and science museums, and introduces the NISE Network. This 19-page paper by Alpert, Isaacs, Barry, Miller, and Busnaina, published in the Proceedings of the 2005 American Society for Engineering Education Annual Conference, examines the impact of the development of nanoscale science and engineering on K-12, university, and informal science education and describes the outcomes of the education outreach partnership between the Center for High-rate Nanomanufacturing and the Museum of Science. This ten-page chapter by C. L. Alpert in the 2007 book, Nanotechnology: Societal Implications II, edited by M.Roco and W. Bainbridge and published by the National Science Foundation through Springer, makes the case for the importance of researchers working with ISE organizations to engage public audiences in awareness of nano research and its implications. This seven-page report by Randi Korn & Associates, delivered in June 2006 to the New York Hall of Science summarizes the results of a phone survey of scientists who serve as volunteers inside and outside of science museums, and of the science museum staff who work with volunteers. The report identifies characteristics of effective volunteer partnership programs and provides recommendations. What Factors Predict Scientists' Intentions to Participate in Public Engagement of Science Activities? This 23-page paper by Ellen Poliakoff and Thomas Webb in Science Communication 2007; 29; 242, reports on a study designed to determine the significant factors predicting scientist involvement in public outreach, including attitude, perceived behavioral control, and descriptive norms. This 2- page article by Michael Rutter published in Harvard University's Department of Engineering and Applied Sciences Fall 2004 newsletter, describes the public engagement partnership between the university's Nanoscale Science and Engineering Center and the Museum of Science's Current Science & Technology Center, and C. L. Alpert's notion of creating a national Nanotech Informal Science Education Resource Center to foster broad collaboration among research institutions and science museums.